In preparation of Jame’s arrival, we moved the boys into the larger room and redecorated. After giving much thought to the inspiration behind the nursery/room and the idea of environmental influences on children, I decided that I wanted to create a space that would challenge the mind and influence my boys of worldly things filling their space with items that tell stories and teach them of exploration. 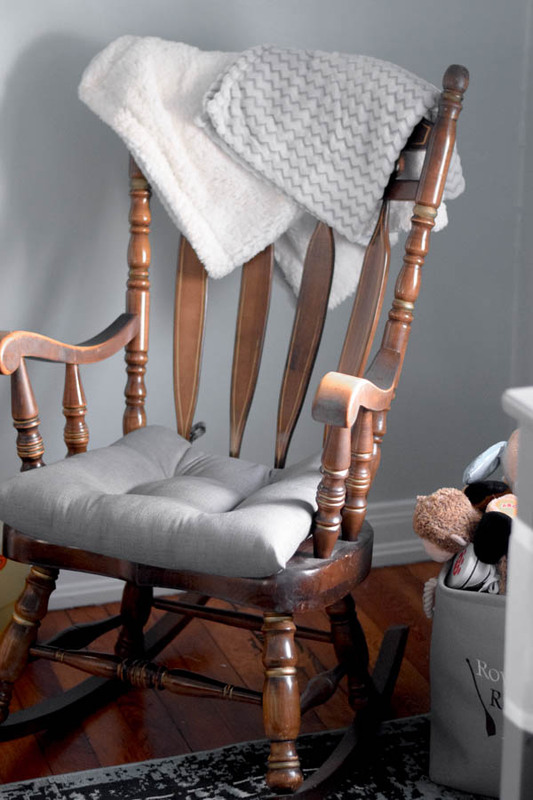 One of the most special items in their room would be the family heirloom rocking chair. This piece was their great, great grandfather’s rocking chair. I vaguely remember my grandpa Willy quietly rocking in this chair as a little girl. It was then passed down to his daughter, my GiGi / grandmother, and then to me. I have spent many late nights rocking Jack in this chair and now it will be James’ turn! Cool rustic animal heads, navy plaques from my grandfather’s service journeys, and antique ship fixtures from Ben’s grandfather’s days as a merchant marine make great story pieces for the boys to learn about other living creatures in the world and the mighty family stories of the men who came before them. One of my favorite fixtures is Jacks measuring stick. My sister made this for him before he was born and she has one for James in the works as well. We mark Jack’s growth process on his extra large ruler. One day we will detach it from the wall and send it off with his wife when he moves out so that he may be able to continue the tradition with his own children. This is such a special piece for me. As always, it is super important to me that the presence of the Lord is always visible to my boys. I want them to recognize Jesus when they see him. Jack is always talking about how he loves Jesus so Jack’s Nannie, Ben’s mom, got him a statue for his room. I am not sure if it is my Roman Catholic roots or what, but I have always put a cross above my door in all of my apartments or houses and now I also keep one above my boy’s door. I am not sure where I hear this, probably as a girl in catholic school, that a cross over a door keeps away the “bad guy” and blesses your house. I would love to hear about the special items in your baby’s/ children’s room! Feel free to tell me all about them in the comments below! Dear Unconventional Mom in 2018….